If you are interested in the slides of the worklfow-ng session, here are they. Finally the first stable release of workflow-ng is out! The module is already stable for a long time and all important features are implemented, so I decided it's time to release. So I'm happy to have a stable 1.0 release out of the door close before the drupalcon in barcelona. If you are going to barcelona, don't miss the session about workflow-ng. Read more about Workflow-ng 1.0 released! Node Profile 5.x 1.2 released! I'm happy to announce the 1.2 release of node profile. Apart from a lot of bug fixes the new release features integration with the rolesignup and the workflow-ng module. Read more about Node Profile 5.x 1.2 released! This module provides configurable content links, that generate events when they are pressed. So one can use it to just create toggling links for any content - where the the link status is available to views thanks to the states module. But much more important, it brings the "scheduling" feature to workflow-ng. So the tutorial at http://drupal.org/node/175319 already shows how it can be used to schedule the publishing of content, but as it can be combined with every action there are tons of possible use cases. E.g. I plan to build "scheduled publication of node revisions" with it. Read more about Workflow-ng 5.x-1.0 beta1 released! I've continued working on worklfow-ng during the last weeks. I've polished the API, wrote some useful conditions and actions, and completed the UI module. I did some more thinking about the UI and how to make creating conditions and logical operations easy - hopefully it is. Here is a screenshot of the current UI: Now I'm about to create a first beta release and focusing on the documentation. Stay tuned. I'm currently working on the workflow-ng UI.. I've got the basics, now I've to finish it. Here a screenshot, how some configured conditions and actions look like: Thanks go to lullabot, for the nice gpled icons..
events, for which conditions and actions can be configured. They may be contributed by modules. So workflow-ng works event based. (And no, I'm not talking of calendars ;) E.g. 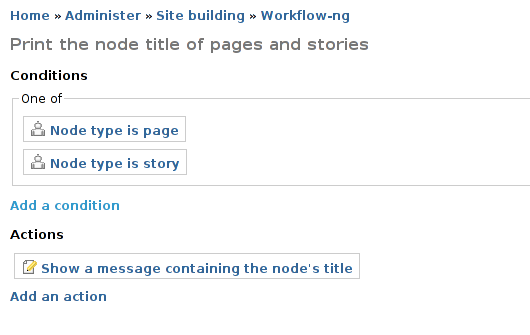 workflow-ng defines some basic events for drupal core, like 'node update, 'node insert', 'user update' and so on. So this are the events you can react on by defining conditions and actions for them. What makes workflow-ng powerful is, is it's flexible handling of arguments. Each of these events has to define a list of available arguments. Then any conditions and actions, that can work with these arguments, can be configured for this event. So an action can be used in any situation, where the suitable arguments are available. There is no need for the action, to be coded aware of every event.. :) As modules may define further events, this enables module authors, to easily allow site administrators to customize the behavior by just defining some further events. it is as flexible as you want. It can work with per content type settings, per node settings as well as with flexible Access Control Lists. it trys to reuse existing functionality instead of reimplementing it. So one can install the ACL module and set per user access control settings per node. it optimizes the written node grants, so that only really necessary grants are written.